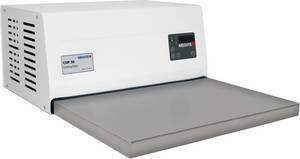 For the rapid cooling of paraffin blocks during tissue processing or cutting. The COP 30 tissue cool plate enables the cooling of approx. 60 to 100 embedding molds or paraffin blocks simultaneously. The quiet and environment friendly cool unit performs a maxium cooling temperature of -15 °C after only a few minutes. The temperature is adjustable and visible by digital control. The cold plate is made of polished stainless steel, with heated brims to prevent condensation.